SEMCOR has become a leading metal hose supplier by building a reputation of delivering reliable products on-time and helping customers find the right metal hose for their applications and markets. We work with customers from the engineering and manufacturing process through installation and future development. Get the protection you need from harsh chemicals, extreme pressure and fluctuating temperatures with a metal hose from SEMCOR that safeguards your mission-critical operations. Be sure to ask our experts about metal hose in corrugated and stripwound versions and the flex connectors or metal expansion joints you need to get the job done. These amazing products allow our clients to deliver tremendously important and sensitive applications all across the world — and sometimes beyond. Even in the most extreme situations, metal hose products will excel. Transporting chemicals in medical equipment as well as in measuring and control equipment. Supporting ventilation in technical building equipment. Conveying coolant, exhaust, and chemicals in automotive and industrial settings. Shielding fiber optics and sensitive electronic cabling. Protecting and conveying liquids in extreme situations such as aviation, space travel and inside of reactors. A metal hose can also feature braiding to improve its resistance to internal pressure and outside force, all while maintaining the flexibility you demand. Hose Master Corrugated and Stripwound Metal Hose. Hose Master offers a complete series of corrugated and stripwound metal hose designed to meet conditions ranging from transporting chemicals, serious torsional stress, strip flare-ups when cut, crush applications or the safety required to shield fiber optic cables. Anamet Stripwound Metal Hose. Anamet offers two different stripwound hose with a stainless steel core built for exceptional crush and corrosion resistance. These specialize in staying put with options for the perfect materials and jackets for your specific applications. 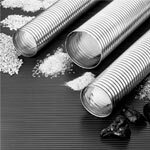 We stock a complete range of corrugated metal hose trade sizes from 5/16” to 4”, and we can supply a variety of specialty items when you need it. Operating as a metal hose supplier, we can also manufacture specific components for your next job. Fluid control is a significant need for our customers, and we stock a full range of metal hose products to help you manage that application. Review our products there and contact us right away if you need custom fabrication or specialty machined parts to keep your operation running smoothly.